Mowing the lawn is one thing I definitely don’t enjoy doing. For the first time since I was 12, I recently found myself with a lawn I was responsible for mowing. To avoid investing in a gas-powered lawn mower, maintaining a piece of machinery, and burning fossil fuels when I could be burning calories, I decided to buy a push mower. It’s really not that hard to use as long as you keep up with it weekly or fortnightly, but it still seemed tedious. You have to work in long, narrow strips, grass gets wound up in the wheels, and why do we even need perfectly manicured lawns anyways!? Well, I’ve decided I don’t like mowing lawns because it’s not a very badass use of my time. Scything on the other hand: totally different story. Who wouldn’t want to take a 30cm blade and demolish a field of grass in half the time it takes to use a lawn mower or weed-whacker? With a scythe blade, you might call it the lawn mower of choice for ninjas. 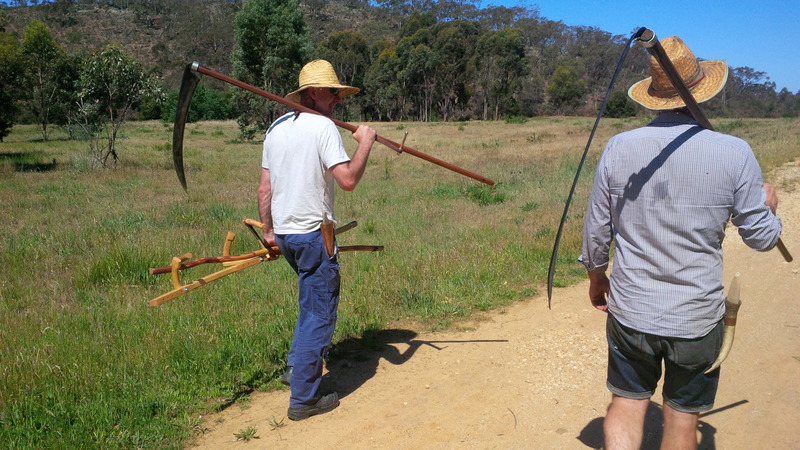 Seriously, for real this time, scything is a very elegant tool that has been all but forgotten in Western society. As my instructor Joel Meadows pointed out: there’s no denying the elegance of an internal combustion engine, but that’s where the elegance ends with weed whackers (or whipper snippers as Australians call them). At the end of the day you’re just whipping at grass with little strips of plastic. The only reason it’s effective is because it uses brute force, and even then it’s time-consuming, burns through fuel and plastic blades pretty quickly, isn’t very good for your hearing, and still involves physical exertion. A scythe is a curved blade that comes in various lengths and construction that attaches to a long handle called a snath. The blade is run along the ground in a 180 degree arc, slicing through anything in its path and leaving a neat row of clippings along the left side of your track (so much less raking up afterwards!). Joel showed us examples of English blades (those most commonly found in England, Australia, and America) and European blades. The ones we practiced on were European and the main distinguishing feature is that they are one piece of metal whereas the English blades are two pieces welded together. The scythe has several components to it, illustrated at right. Toe – This is the tip of the blade, blunted to avoid causing injury to yourself or those around you. Belly – This is the curved underside of the blade, which gets slide across the ground while scything. Beard – This is the widest part of the blade. 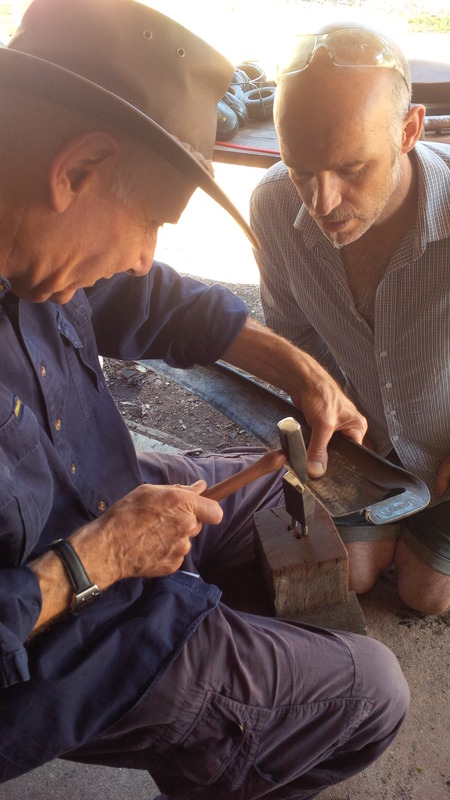 Heel – This connects the blade to the tang and helps determines the angle of the blade. Tang – This the part of the blade that secures into the snath. Ring – This secures the tang to the snath, and should be done so rear grip is equidistant from the beard and toe. For a more aggressive angle (say if you’re working in tight areas), you can shorten the length between the toe and grip. Snath – This is the long handle and comes in a variety of styles. Some are straight, some have a slight bend, and some have a very exaggerated bend. The first grip should be roughly at the level of your hip bone. The distance from the first grip to the second should be roughly the length of your elbow to your fingertip. For average conditions, the distance between the first grip and the beard should be the same as from the first grip to the toe. When standing comfortably at rest, the edge of the blade should be angled slightly upwards and the toe of the blade should not be catching on the ground so that you don’t have to put effort into getting the proper angle. This is called the Lay Angle. Usually all of these measurements can be adjusted by moving handles (if there are multiple settings) and by adjusting the ring that holds the scythe in place. It’s not rocket science, but there is definitely some technique to learn. Nice, wide-sweeping 180 degree angles should be used, although tighter sweeps or even a chopping motion can be used in very tight locations. The belly of the blade should glide across the surface of the ground and the blade should be angled upwards. Care should be taken not to catch the toe of the blade into the ground or else your sweep gets stopped. Periodically (every 5-10 minutes), you should stop to whet/hone your blade using a whetstone. This makes it much easier to keep cutting without exerting too much effort. Joel was definitely much better than the rest of us, but I could see how with a bit of practice it could become quite easy and efficient. After each scything, the blade needs to be repaired. Joel has a background as a blacksmith, so this part of the day was particularly useful. Sand the blade to prevent introducing rust into the metal. Use a chainsaw file to file back any cuts in the blade back to the point where the cut stops. Instead of a cut showing in the blade, you want to just have a nice arch where it used to be. Using a repair anvil and the flat end of a cross peen hammer, work the metal material down from the top of the blade to the indentation arch created by the chainsaw file. The blade should be upside-down during this part of the process. Once material has been worked down, use a peening anvil and the pointed end of the cross peen hammer to bring the material to a point so that the blade is now straight and sharp again. The blade should be facing up during this part. This should be done at the end of each day so that the blade is always sharp and ready to go next time. You should also put some oil over the blade to prevent it from rusting while not in use. Maintenance will definitely be the hardest part of using a scythe to hone in, but like anything this will come with practice. I was definitely no pro, but I could see how using a scythe can be an incredibly efficient way of clearing large lawns or pastures. For having a well-manicured lawn, probably a lawn mower is best, but if your aim is clearing out tall grass in larger areas then the scythe will work great and doesn’t require as much effort as other methods. When used in shorter arcs or even chopping motions, I found the scythe to be incredibly effective at effortlessly chopping through even the thickest of weeds and bushes, so I could see it being highly useful for this as well. It really is an elegant tool and since the blades come in all shapes and sizes, you can keep a few different types for various applications (large pasture, tighter spaces, bushes, garden spaces, etc.). At some point between now and when we establish a homestead, I am sure I will be adding a scythe to my collection of tools!